Long before becoming pregnant, I was trained in prenatal yoga. I learned about the changes in a woman’s body during pregnancy. I knew how to help my pregnant students modify poses that could be uncomfortable or unsafe. But it’s one thing to study a pregnant body and another to experience it. Some modifications I learned I have personally found unnecessary during this pregnancy, while other poses that are considered safe for pregnancy haven’t felt so awesome in my body. So what I’ve learned is that while there are guidelines, the best rule is to listen to your body. As I’ve explored this preggo body on the mat, these are a few of my favorite prenatal yoga modifications. Early on (I’d say maybe from week 8-20), backbends of any kind felt horrible. Surprisingly, this has changed. Now camel pose and wheel are accessible and even feel good to me — poses that are supposed to be off-limits for preggo yogis. That being said, upward-facing dog still isn’t my jam. Sometimes I hold a high plank during vinyasas (the flow between poses/series of poses in a vinyasa or power yoga class), but mostly I’ve enjoyed this modified variation that includes a gentle heart-opener that feels better than upward-facing dog. This isn’t a modification — this is a regular 'ol asana. But bump and I have been a big fan of this pose, so I’m including it on this list. It feels so great to stretch my hip flexors and this pose gives bump plenty of space while doing so. Come to a low lunge position with one foot toward the top of your mat. Lower your back knee down. Deepen your lunge as you place your hands on your hips or reach your arms overhead, focusing on stretching the front of your hip. Depending on how big your bump is, you might need to take your front foot a little wider on your mat to give baby some space. Stay for 3-5 breaths and then repeat on the other side. Core work is important during pregnancy, as a strong core can help during delivery. Problem: most core exercises are off-limits. Any movements that are belly-up (like any form of crunches) are a no-no. But with a little creativity, you can still work your core. Here are a couple of my favorites. Modified Leg Lifts: Lean back on your forearms. Extend one leg long while bending the other knee with your heel toward your glute. On an inhale, lift your extended leg up. Exhale to lower it down. Repeat until … well … you’ve gotten your fill. Then repeat on the other side. Side Plank: Come to a side plank pose with feet stacked or staggered, focusing on lifting your hips high. No modification here, but I do need to drop to my knee after a few breaths. After all, we are adding some weight to this pose! Side plank is a great oblique exercise that’s totally cool for preggos. As my belly has expanded, standing or seated forward folds with my legs together have been impossible. Because, well, there’s a belly in the way. Taking my legs wide feels much better and gives bump space. This might seem like a no-brainer, but I see pregnant women struggling to get into forward folds. Forward folds should be relaxing, not strenuous. Don't be afraid to take your legs wide. A lot of spine-strengthening yoga postures require lying on your belly — Cobra, locust, bow pose, etc. That’s an obvious “nope” for bumps. During this portion of classes, I’ve enjoyed a couple of safe spine strengtheners. Spinal Balance: Come to all fours in a table-top position. Extend one leg back behind you, pointing your toes down toward the mat to level your hips. Stay here, or extend the opposite arm forward. Hold for a few breaths, then repeat on the other side. Cat/cow: This common yoga warm-up engages your spine. Come to all fours in a table-top position. Inhale to drop your belly, pull your heart forward and gaze up (Cow pose), exhale to curl and round your spine like a scared cat (Cat pose). Repeat several times, following your breath. I felt fine lying on my back until recently, though some say you should never lie flat on your back while pregnant. But I find it challenging to completely relax while lying on my side on the mat. This variation of savasana requires a lot of props, but it feels amazing. It can feel discouraging when you can’t get into poses you regularly practice. Instead of feeling discouraged, I remind myself that my body is doing something much more challenging than any yoga pose. It’s creating life. IMO, that’s more impressive than any asana. Plus, it’s been fun to explore poses from a new perspective. 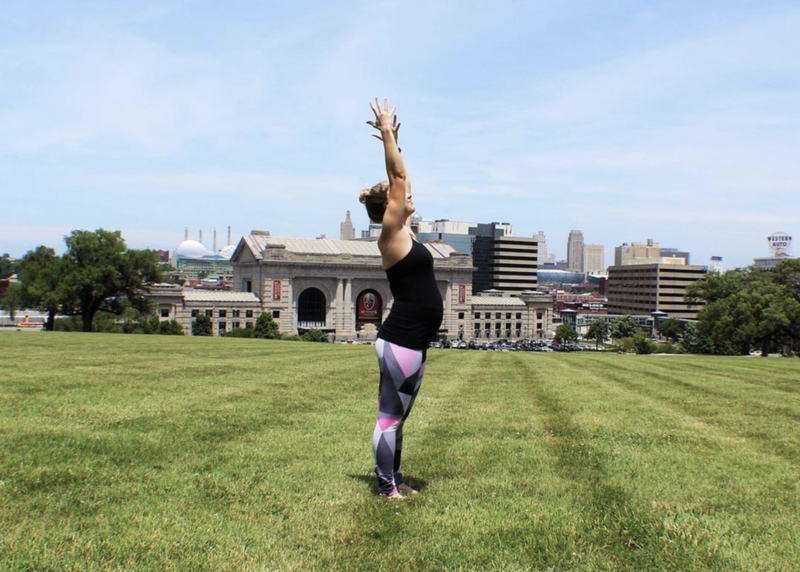 We are creatures of habit, and being pregnant has forced me to look at poses differently and play with modifications to figure out what serves me best. In many ways, it’s invigorated my practice. Preggo yogis: What have been some of your favorite prenatal modifications? Were you surprised by any of the changes (or perhaps lack of changes) in your practice?